Here's how the "Designing for" articles work. 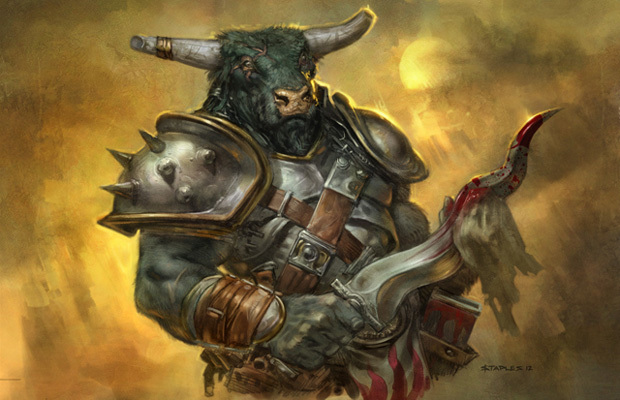 For each, I answer the same four questions and then I explore how each of the two guild's mechanics were designed (the one from the original Ravnica block and the one from, in this case, Gatecrash). Hopefully, this is the sixth one you've read so you already get the hang of what's going on. Red and white have the most efficient one- and two-drop creatures. (To be fair, white's the color that excels at this; red's weenies are okay, and are helped by the fact that red is the best at getting blockers out of the way.) White has a defensive side, but that part doesn't show up when it teams up with red. Instead, out comes the army flavor that quickly assembles and attacks. Red and white also are the two colors best at combat. The two colors are both the home of first strike and double strike and they tend to have the best cheap instants to play during combat (okay, green does have Giant Growth–like effects—those are good, too). The two colors are both good at getting through with their attackers. White has evasion like flying and protection. Red has trample and intimidate. White also has Pacifism effects to remove blockers, while red uses spells like Panic that make creatures unable to block for the turn. Red and white also overlap in the flavor of an army. True, white's army is uniform and structured, while red is a ragtag collection of people with their own agendas, but the two colors are the ones where the little guys band together to take on the big guys. Red and white might not be kings of the long game, but they are experts at the short one. 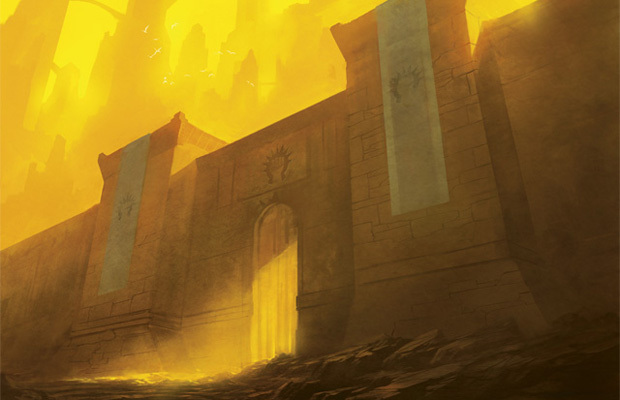 If all you had to design was one- and two-drop spells, you'd be golden. Unfortunately, both colors have to flesh out to cover spells with higher mana costs, and that's where red and white start going their separate ways. There are a few overlaps. Red and white, for instance, both like big 4/4 fliers (Dragons and Angels, respectively). One or two are fine as finishers in a deck, but a weenie rush strategy cannot support all that many expensive cards. As the cards get more expensive, you start to see the colors pull in other directions. Red starts ramping into bigger creatures and larger destruction spells. White gets much more defensive and begins doing things to slow down the game. There does exist a slow red-white deck that acts more like a control deck using white's spells to stall and red's spells to blow up threats, but that deck is much harder to piece together than the weenie deck. The other issue of contention is that the wants of the two colors are opposed (they are enemies, after all), so once the two get out of "army attack" mode, they start wanting different things. White tries to control things while red likes to cause chaos. This can make it hard sometimes to capture the flavor of both. That's why you tend to see red-white cards leaning toward the military. I like to think of the Boros as "purpose with passion." Cheap, aggressive creatures and spells. The Boros defeat you not because any one piece is big and scary, but because the combination of all its little things is big and scary. Red-white is about hitting the ground running and trying to end the game before it has to stop. This means there is a lot of focus on getting the best advantage you can from the early turns. One-drops are meaningless in many color combinations but are crucial in red-white. When designing red-white, for example, I usually make sure that both white and red have two one-drop creatures in common. Usually, the other colors only have one (green is the only other color that sometimes has two). We also always make sure that red and white have cheap combat-oriented spells that you want to use to help attacking creatures win combat. The finishers for red-white tend to sit in the four- or five-drop spot. You don't get many of them, so you want to make sure they are going to do the last bit of damage to take the game. The key here is keeping focus on cheap and aggressive. Every card has to be lean and mean and do its job efficiently for its cost. The key to understanding how red-white plans to win is this: All its answer are themselves threats. Now let me explain what exactly I mean by this. When you step back and look at Magic from a distance, it's a game about flow, where initiative passes back and forth between the players. At any one moment in time, one player is the aggressor and one player is the defender. In many games, these roles can go back and forth. Sometimes you're the one playing to win and sometimes you're the one working not to lose. Red-white's basic strategy is to try to take the aggressor role early and never give it up until it wins. To accomplish this, all its tools need to be focused on being the aggressor. That means that red-white doesn't have room in its deck for cards that only serve as answers. Its answers are cards that also have uses as threats. For example, red's direct damage can be used to remove blockers or just straight win the game. If red finds itself on the defensive, these spells can be used defensively. The need to have threats that can double as answers drives the focus of red-white. I've publicly claimed on multiple occasions that I feel this mechanic was the big miss of Ravnica block. Note that I don't think the mechanic itself is necessarily bad, I just feel it doesn't have enough of a Boros feel. Haunt and forecast, which are the other two Ravnica block mechanics I have a beef with, designwise (dredge was more of a development issue than a design one), both at least have good guild feels. So what happened? How did radiance end up being the Boros mechanic? It all started with a desire I had as the lead designer of Ravnica. For each guild, I designated the space I wanted us to aim at. For Boros, that was an army feel. I knew the Boros were going to be the army of the world and I wanted to make sure their keyword tied into that army feel. A key part of that, I felt, was that the mechanic needed to be relevant in combat. The Boros wanted to be the weenie rush guild, so I knew they would be constantly attacking. That meant they would force the opponent to have to block, so why not give the Boros a mechanic to help win those fights? Radiant – Target creature and every creature that shares a color, creature type, or converted mana cost with it gets +1/+1 until end of turn. Mike's idea was that these spells actually hit a swath of creatures and you had control of what that group was by which creature you choose to target. Because a Boros deck would be made up of similar creatures, these spells could easily be used to buff the army even if that army didn't have one singular connection. Just aim at a multicolor red-white Human Soldier, for instance, and odds are you hit all of your attackers. Playtesting showed that Mike's initial idea was too hard to play with. Should I target this white creature and boost my white creatures, Humans Soldiers, and creatures with a converted mana costs of 2 or should I target this red-white creature and hit all red creatures, white creatures, Minotaurs, and creatures with a converted mana cost of 4? It was just too much to process. In design, we removed converted mana cost and in development creature type would be removed as well. Color, it was decided, was plenty complex. Another problem was that radiance was not limited to one player's creatures. If I wanted to boost my creature, I might be boosting some of your creatures as well. In addition, because each spell was really affecting a group of creatures, there was limited design space. (We just don't make all that many cards that target many creatures in a set, especially at low rarities.) Also, the swap between cards you wanted to use on your creatures and the ones you wanted to use on your opponent's creatures made it hard to grok what exactly the role of radiance was. The real problem, though, seen with 20/20 hindsight, was that the connection between radiance and the Boros was too far removed. Yes, Boros wants to be aggressive and attack with a swarm of small creatures. Yes, radiance works best on spells that want to target a large swath of creatures. Yes, there's an overlap in those two groups. But it's a two-step process to even see the connection. The key to the best guild mechanics is that they communicate very loudly that they are advancing that guild's goals. The Golgari love the graveyard and recycling so their mechanic uses the graveyard and recycles. Radiance doesn't feel like it has an agenda. It does a variety of different kinds of effects that can be used in a variety of different ways. It has a wide decision tree that allows a lot of options. None of this says Boros. The one silver lining of radiance was that, coming into Gatecrash, I felt like I owed the guild an extra good mechanic. (Dimir and Boros are the two guilds that were in both Ravnica-based sets I was lead designer on.) Luckily, I was able to come through on that promise. During previews, I explained how battalion ended up in the set. For those who didn't read it and refuse to click the link, here's the super-short version: Designer Shawn Main made the mechanic, then called "assault," in Great Designer Search 2. I liked it and felt it was Boros. I put it in the set. And... scene. I thought today I'd talk more about how having battalion as the Boros mechanic affected the design of Boros. As I explained in my preview, I made one tweak to Shawn's mechanic. In his initial version, a card with battalion said, "Whenever three or more creatures attack this turn, CARDNAME gains BLAH." I changed it so that the trigger required that the creature with battalion be one of the three creatures attacking. While this seems like a pretty subtle change, it did have one ramification. Shawn's initial version clearly wanted to go on creatures but wasn't limited to just creatures. (You could imagine, for example, a land that gains the ability to tap for two of any color mana if three or more creatures you control attacked.) My tweak forced every card with battalion to be a creature. While the change narrowed design space, I felt it was more flavorful and encouraged the play pattern we wanted. The effects for battalion fell in two camps. First was the cards that boosted either themselves or your whole team. The second was cards that created a spell-like effect. I made the decision that the common cards with battalion would only be of the first type and would only boost themselves. This was done to be compliant with New World Order and help keep battalion from making the board state too complex. Higher rarities could affect other creatures and could generate spell-like effects. The first category was easy to make, as it was just a matter of listing out what creature keywords were available to red or white. It's not that long a list. A quick aside. I often talk about how designing guild mechanics is different because only having to make eight to twelve cards opens up mechanics that have less design space. Battalion falls into this camp. If you don't want to repeat effects, there really is a limited number of cards that can be designed. The second camp of effects—the spell-like effects—had a few limitations, the biggest of which is that it had to trigger when the creature attacked. This forces the spells to be proactive rather than reactive and encourages the designers to choose effects that can be relevant in combat. I believe we were even a little more aggressive in design but development adjusted it to match the speed we needed for Boros in both Limited and Constructed. Creatures (Especially Cheap Creatures): This was one of the biggest pluses to battalion. Boros is a guild that wants to be about creatures so it's nice to have a mechanic that pushes you to build an army. Cheap creatures are especially important because the Boros deck wants to "power up" as fast as possible. Battalion is what Ramp;D calls "a threshold mechanic," meaning that once you get to a certain state, its abilities click on, so there is a lot of push to quickly get to that state. Combat Tricks: These are cards that help you win combat fights. The reason these are so important is that Boros needs to attack but wants to always ensure it has three creatures in play. Combat tricks allow you to aggressively attack. Also, even having a few makes bluffing easier. Creature-Saving Spells: These work a lot like combat tricks in that they allow you to be aggressive when attacking. Cards Granting Evasion: Boros needs to keep attacking but doesn't want to drop below three attackers. Often, getting one creature through helps you turn on your battalion, which will help protect the other creatures. Cards that prevent blocking, like Panic, also fall into this camp. Creature Removal: Okay, all Limited decks like creature removal. Boros can dig much deeper, using lower-quality creature removal spells because it wants to use a lot of its creature removal early to clear the way for its creatures. This means that cheap removal that only works on small creatures is usable by Boros. You'll notice that most of these effects are generally good in Limited. The difference here is that Boros is able to use cards that aren't normally thought of as A-level cards. Its needs allow you to prioritize cards that might not get played in a slower deck. One of the expressions I like is "game design is often a game of inches." That means the key to making certain environments work is often just gently pushing cards in a certain direction. Boros design definitely falls into this camp. Nothing we did is something you wouldn't normally see in red and white, but the combined choices help make the Boros strategy a little better than normal. Some color combinations are a struggle, but red-white is not one of those combinations. 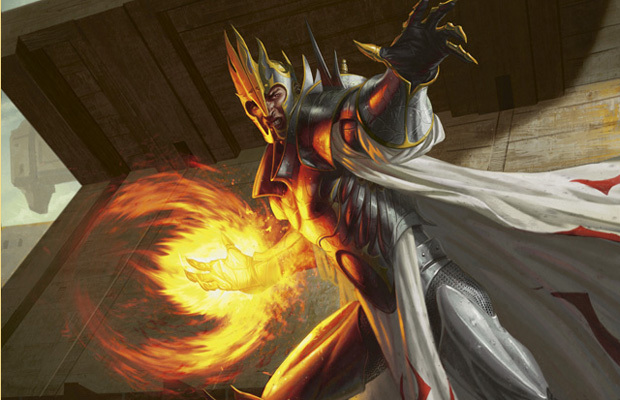 There's a lot of overlap in the colors—especially the parts that meet in Boros. The biggest trick is not individual card design but making sure you have the right mix of cards (both in effects and costs) to get the job done. I hope you enjoyed the peek at Boros design and, as always, I'm curious to hear your feedback. Feel free to respond to me in email, in this column's thread, or on any of my social media (Twitter, Tumblr, and Google+). Join me next week; it'll be the nuts (and bolts). Until then, may you do good even if you get your hands a little dirty. After discussing a lot of sets of days gone by, I thought I'd talk about a design a little closer to modern day: Innistrad.